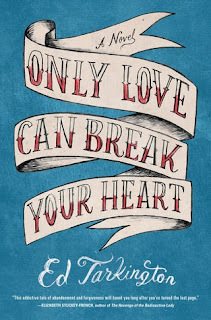 Only Love Can Break Your Heart by Ed Tarkington is a very highly recommended coming-of-age novel about how love is embodied and embattled in many different relationships. The novel focuses mainly on Rocky's relationships and is set in the seventies and eighties. The novel opens in 1977 in Spencerville, Virginia, where we meet eight-year-old (Richard) Rocky Askew and his idolized older half-brother, sixteen-year-old Paul. Their father, the Old Man (Richard), is married to a much younger second wife, Rocky's mother. She doesn't trust Paul and question's the Old Man's unfailing devotion to his oldest son, who is considered a long-haired, smoking, drinking "bad boy." None of his mother's misgivings about Paul matter to Rocky, who loves Paul and Paul seems to like having his little brother around too. Her distrust seems justified when one day Paul picks up Rocky from school and takes him on a road trip, into the woods, and nearly abandons him there. Rocky doesn't learn until later why Paul might have done this. Right after he went back for Rocky and took him home, Paul disappeared with his girlfriend, Leigh. He seems to be gone forever, but Leigh returns a few months later. The novel then jumps to seven years in the future. Rocky is now a teen. He's keeping Paul's room and his vinyl records safe. In fact he's adding to "their" collection of records. Rocky's also having an illicit relationship with a neighbor's older daughter, Patricia Culver. This relationship sets into motion a course of events that Rocky could never have envisioned. When the Old Man has a stroke, Paul comes home. He seems calm and at peace now, but there is still trouble coming when a double murder occurs at the Culvers. There is a sound track to this novel and it would enrich your enjoyment if you knew it and knew the time in which the novel is set. Neil Young's album, "After the Gold Rush," is a favorite of Paul and Rocky. Tarkington has a playlist for those who would benefit: Playlist I, however, know the songs and felt a strong identification with the story and the characters because of this. It also didn't hurt that I was a teen in the seventies so I knew the times and could easily bring up a mental picture of all the scenes. The characters are all dealing with the devotion and heartache of various kinds of love, or lust, in many different relationships - between siblings, families, and friends. We see the problems that can arise from these interpersonal relationships and Rocky's ability (or inability) to handle them. Tarkington supplies closure for all the threads and quarries in the novel, which I appreciated. Only Love Can Break Your Heart is exceptionally well written and carefully plotted. This novel was a pure joy to read for the use of language alone. Even though there weren't any great surprises or twists, I found myself totally invested in these characters as they lived through these difficult years of their lives. This is (surprisingly) a debut novel. Tarkington should expect a strong following if his next novel is as engrossing as Only Love Can Break Your Heart.